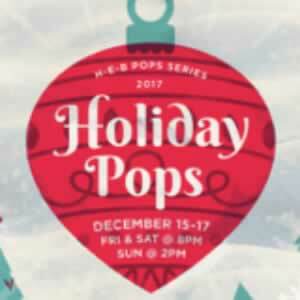 (San Antonio, TX) An annual tradition that rings in the Holidays, the San Antonio Symphony presents Holiday Pops on December 15th, 16th, and 17th at the Tobin Center for the Performing Arts. With Conductor Akiko Fujimoto, the Children’s Chorus of San Antonio, the Trinity University Handbell Ensemble, the San Antonio Symphony offers a magical, sing-along celebration of the season with a program featuring beloved traditional and popular music. Tickets are on sale now at The Tobin Center’s Box Office. Tickets can be purchased on-line www.tobincenter.org, via phone (210) 223-8624 and in-person at the Box Office, open Monday – Friday, 10am to 6pm and on Saturday, 10am to 2pm. The Tobin Center Box Office is located at 100 Auditorium Circle, 78205. Tickets are $25, $41, $56, $70, $81 and $96. The Symphony’s 2017/18 H-E-B POPS Series is packed with incredible performers and artists who will sing, dance, and play alongside the San Antonio Symphony. Perennial favorites Holiday Pops and Fiesta Pops will be joined by new programs including A Tribute to Ella Fitzgerald, Classical Mystery Tour, and a Rodgers and Hammerstein Celebration.